Consumer credit outstanding grew by a seasonally adjusted annual rate of 7.5%, $257.7 billion, in the third quarter of 2015, 1.0 percentage point slower than the 8.5% rate of growth recorded in the second quarter of 2015. Consumer credit outstanding now totals $3.499 trillion. The increase in total consumer credit outstanding partly reflected an expansion in the outstanding amount of non-revolving consumer credit. Non-revolving consumer credit includes auto loans and student loans. According to the report, non-revolving credit outstanding rose by a seasonally adjusted annual rate of 7.9%, $198.2 billion, in the third quarter of 2015, 0.5 percentage points slower than its level in the second quarter of 2015, 8.4%. There is now $2.574 trillion in outstanding non-revolving credit. The increase in total consumer credit outstanding also reflected an expansion in the outstanding amount of revolving consumer credit. Revolving credit, which is largely composed of credit card debt, increased by 6.5%, $59.5 billion, over the third quarter of 2015, 1.8 percentage points slower than the 8.7% rate of growth in the second quarter of 2015. There is now $925 billion in outstanding revolving credit. Revolving credit outstanding is largely composed of credit card debt, and the amount of outstanding credit card debt is partly based on the total amount of credit available to households, the credit limit. According to Figure 1, after declining since the fourth quarter of 2011, the amount of credit debt outstanding began to trend upward beginning in first quarter of 2014. Further, the expansion in credit card debt outstanding since the first quarter of 2014 has outpaced the increase in the total credit limit. However, the credit limit has been trending upward for a longer period of time. Between the first quarter of 2014 and second quarter of 2015, credit card debt outstanding rose by 6.7%, while the total credit limit increased by 5.1%. However, since the fourth quarter of 2010 the credit card limit increased by 15.2% while the total amount of credit card debt outstanding fell by 3.7%. 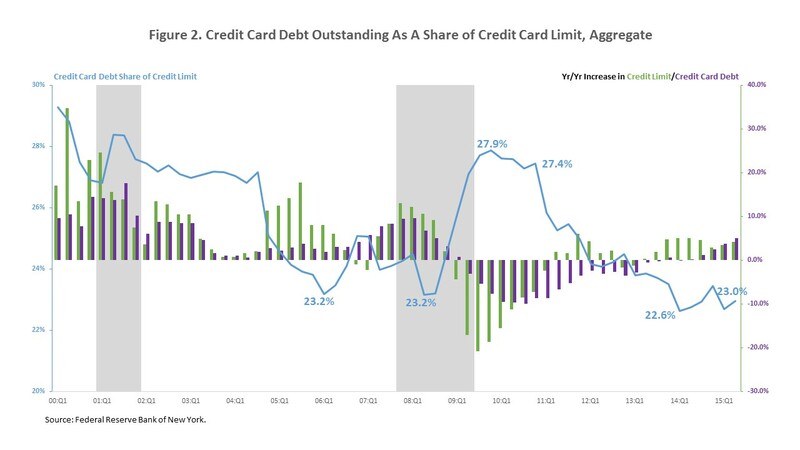 Since growth in credit card debt outstanding has lagged growth in the overall credit limit since the fourth quarter of 2010, than its share of the aggregate credit limit has also declined. Figure 2 shows that the amount of credit card debt outstanding as a share of the credit limit reached a post-recession peak of 27.9% in the fourth quarter of 2009 falling slightly, to 27.4%, by the fourth quarter of 2010. Between the fourth quarter of 2010 and the first quarter of 2014, the period over which the credit limit expanded but credit card debt outstanding shrank, credit card debt outstanding as a share of the total credit limit fell to 22.6%, 0.6 percentage points below its previous low of 23.2% reached in the first quarter of 2006 and again in the first quarter of 2008. 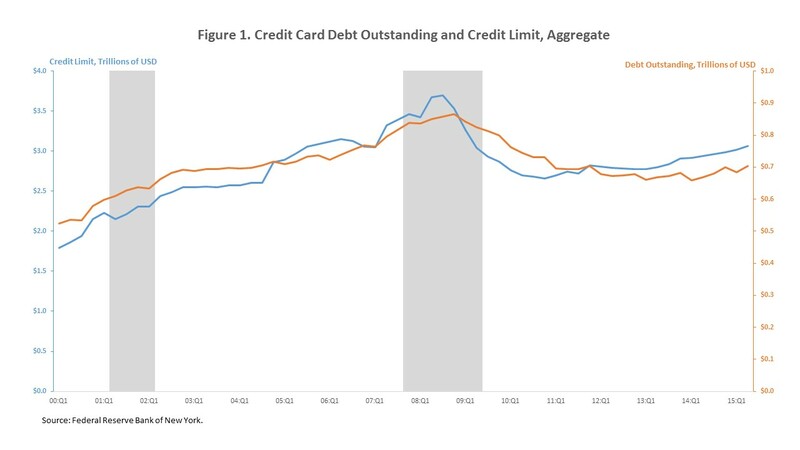 Since the first quarter of 2014, the period in which the growth in credit card debt outstanding outpaced the increase in the overall credit limit, credit card debt outstanding rose 0.4 percentage points to 23.0%. Thank you, for the information. Michael Neal your way is too good it will be helpful for the internet users that are looking for the credit consumer expand.